Maestro Yury Gelman was inducted Into U.S Fencing Hall Of Fame on July 10 at the 2010 Summer National Championships in Atlanta. Yury is the five -time Olympic Coach for the United States (Sydney, Athens ,Beijing, London and Rio), former National Men’s Saber Coach (2000-2012), and Head Fencing Coach for 2001 NCAA Champion St. John’s University. In addition, Yury is an honor coach of Ukraine. He received a Masters degree in both Physical Education and fencing from Kiev Institute of Physical Education. His students won gold, silver and bronze at Cadet and Junior World Championships and countless medals in junior and senior World Cups, including individual and team Grand Prizes. 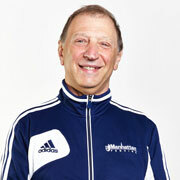 He prepared members of Cadet, Junior, and Senior National teams every year since 1995. Yury’s students, Ivan Lee and Tim Hagamen, were the first to bring a gold medal to the United States in the 2001 Junior World Championships. In 1998 another student, Akhi Spencer-El, was the first US fencer to place first in junior FIE point standings and in 2003 his student, Keeth Smart, was the first US fencer to place first in the senior FIE point standings. Keeth is still the only American who won the individual Grand Prize in Madrid 2003. The U.S. National Team, under Yury’s leadership, won the 2001 Gdansk Junior World Championships, the 2004 team Grand Prize, 4th Place at 2004 Olympic Games in Athens, 5th place at the 2005 Leipzicg Senior World Championship, Silver Medal at the 2008 Bejing Olympic Games (Keeth Smart, Tim Morehouse, James Williams, Jason Rogers), 4 of his students (Tim Morehouse, Daryl Homer, James Williams and Dagmara Wozniak) participated in London Olympics and three of them reached top 8 in individual competitions. Over the past twenty years, Yury has prepared 24 students for the United States National Teams. Akhi Spencer El- Member of Olympic team ’00, Sydney, two-time National Champion. Keeth Smart- Three time member of Olympic team ’00, ’04, and ’08.Silver medalist ’08 Olympics. Ivan Lee-Member of Olympic team 2004, Junior World Champion 2001, Pan Am Champion ’03. Tim Hagamen- Junior World Champion 2001, Silver Medal at Cadet World Championships ’01.2006 NCAA Champion and 2007 National Champion. Tim Morehouse-Member of Olympic team ’04, ’08, 12, Silver medalist ’08 Olympics.8 place in London Olympics, Medalist at Senior World Cups.2010,2011 National Champion. Aleck Ochocki-Bronze Medalist at Junior World Championships ’10, Member of Cadet ’05, ’06, ’07, Junior ’07, ’10 and Senior ’13 National Teams. Two time NCAA Champion ’09, ’12. Daryl Homer-Member of Olympic Team ’12, 6 place in London Olympics, Bronze Medal at Cadet World Championships ’07, Bronze Medal at Junior World Championships ’09 and ’10. Two time NCAA Champion, ’10, ’11. Dagmara Wozniak- Member of Olympic team ’08,’12. 6 place in London Olympics, Junior World Champion 2006 and Bronze ’07, Three times bronze medalist of Senior World Championships. Caroline Vloka- Gold, Silver and Bronze Medal at Cadet and Junior World Championships ’06, Bronze ‘07.2010 NCAA Champion. Emma Baratta- Silver Medal at World Championships ’04. Monica Aksamit – Silver medalist at Junior World Championships ’08. Member of Cadet ’07,Junior ’08, ’09 and Senior National team ‘09. Alex Krul- Bronze Medal at Junior World Championships ’05. James Williams- Member of Olympic team ’08, ’12. Silver medalist of Olympic Games ’08, Member of ’06,’09 and ’10 Senior National team. 2012 National Champion. Paul Apostol – Two times World Veterans Champion (60+) in ’06,’07 and silver medalist ’08. National Champion ’05,’07 and ’10.